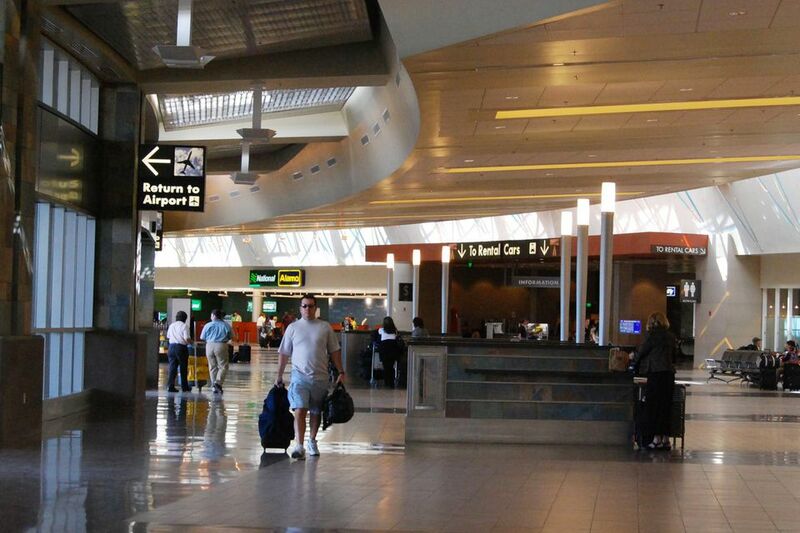 The Rental Car Center provides one-stop shopping for rental car customers at Sky Harbor. Arriving passengers don't have to look for individual rental car company buses at the terminal curbs. They take a designated Rental Car Center bus for a five-minute ride to the facility. Customers are dropped off at the customer service level of the building, where all rental car counters are located side by side. Customers return their rental cars to the same location. Upon arrival in Phoenix proceed to the curb on the baggage claim level. Look for the Rental Car Shuttle pick up area, which takes passengers to the center. The signage is clear. Buses run often. The Rental Car Center at Sky Harbor International Airport in Phoenix is open 24 hours, seven days per week. Most rental car companies renting cars at the airport are also 24-hour operations, but the ones that are not will have some way for you to securely drop off your car keys if you happen to be there during nonpeak hours. To be certain, you might want to call the car rental company itself to verify that an agent will be on duty when you want to return your car. Here are the direct phone numbers for the car rental companies at the Phoenix airport rental center. All of Sky Harbor's rental car companies are required to be open one hour before the first flight and one hour past the last arrival. Phoenix rental car customers will find added convenience at the Phoenix Sky Harbor International Airport Rental Car Center. The facility houses all of Sky Harbor's rental car operations under one roof. The rental car counters are located inside of a 125,000 square foot customer service building which sits on top of a three-level parking garage. The garage has the capacity to hold 5,600 rental cars ready for customer pickup. The Sky Harbor Rental Car Center is conveniently located west of the airport near two major interstate highways, I-10 and I-17. It benefits Sky Harbor and its customers in a number of ways, easing congestion on the airport roadways and reducing confusion at the curbs. Here is a map with directions to Phoenix Sky Harbor Rental Car Center. Phoenix is the 3rd largest airport rental car market in the United States. About 1.4 million rental car transactions are processed every year at Sky Harbor. a traffic information system, which shows freeway drive times to various locations around the Phoenix area. a staffed information counter offering personalized assistance along with printed materials. full coffee services, food to go, snacks and sundries for sale. Once you have your rental car, you will exit the area. The great majority of people will follow the signs to the freeways: I-10, I-17, and SR-51. Tip: I-10 is generally an east-west highway, but in parts of the Phoenix area it travels in a north-south direction. If you are driving south toward Tempe, Chandler, or Tucson, you'll want to take I-10 East. Did You Lose It at the Airport? Maybe You Can Get It Back! Can Flights Be Delayed Due to Heat?